Our Historic Inn Location, Location, Location!! Old Customs House Inn & Cafe is a cozy Inn located in historic downtown "Old Town Key West", right in the middle of nearly everything Key West has to offer yet offers a subtropical getaway 130 miles from the mainland of Florida. 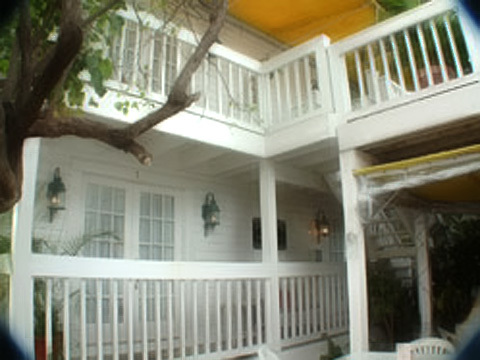 Old Customs House Inn is a cozy place to stay located directly on Duval Street, the main street on the island of Key West. When you stay here, you are walking distance to and from most everything. Attractions, major bars, pubs, and restaurants are all nearby. The Inn is 1/2 block from the pier called "Mallory Square" where the nightly sunset celebration takes place featuring many fine local and traveling street performers, and nearly all the tourists are spectators! Everything is a very short stroll away. You just can't find a nicer, more convenient place to stay! About Our Rooms Our rooms are quaint, clean, and private. We feature two types of rooms with many amenities; Suites that feature two queen beds, and Studios that feature one queen bed. The handcrafted beds are made of original Dade County Pine. All of our rooms, both studios and suites include a private entrance and private bath, sitting area with cable television, local telephone, air conditioning, ceiling fans, efficiency kitchenettes with refrigerator, microwave, quarters that have a wicker sitting area with beautiful Key West island decor. Rooms have daily housekeeping service. Sleeping arrangements for studios feature an additional twin mattress, and one queen sized bed. Our suites have 2 queen sized beds and an additional twin mattress. Other amenities for both types of rooms include: saltillo tiled baths, antique claw foot tubs (suites only), and hardwood floors.